Social marketing specialist, educator, and Party Aficionado. Founder of Social Media Tulsa. It's a Tumblr blog. The websites creator or author is Cheryl Lawson. 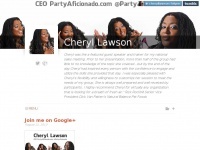 A profile of Cheryllawson.co was found on the social network Twitter. The web server used by Cheryllawson.co is located in New York, USA and is run by Tumblr. There are many websites run by this web server. The operator uses this server for many hosting clients. In total there are at least 8,626 websites on this server. The language of these websites is mostly english.